leica.overgaard.dk - Thorsten Overgaard's Leica Pages - Page 20 - Leica M Monochrom Henri Digital Rangefinder Camera - Page M: "Momochromatism and Minalism"
This page is written before the Leica M Monochrom was released and cover the release of the Leica M Monochrom as well as the background for the camera. For practical advice, jump to page 21 and start reading. Leica M Monochrom with Leica 90mm APO-Summicron-M ASPH f/2.0. 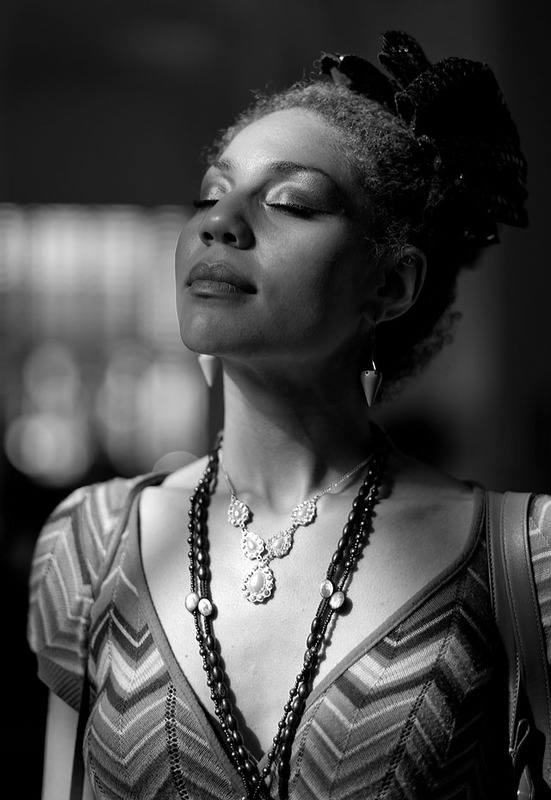 American singer and model Joy Villa, Washington DC, September 2012 (Final production camera, not prototype). 100% crop of the above. Leica M Monochrom with Leica 50mm Noctilux-M f/1.0, Washington DC, September 2012 (Final production camera, not prototype). 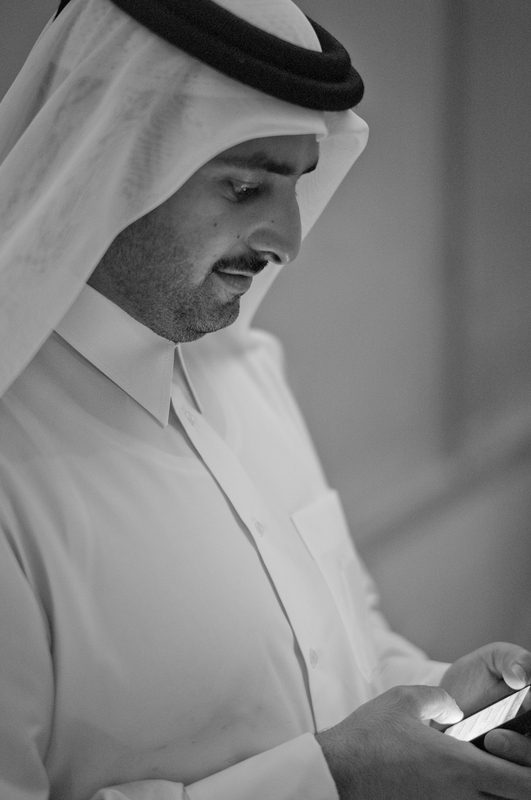 Hamad Al-Thani captured at 5000 ISO with Leica M Monochrom and Leica 50mm Summilux-M ASPH f/1.4. Download DNG file for this image. In short, this camera is aimed at revolutionizing black and white photography. 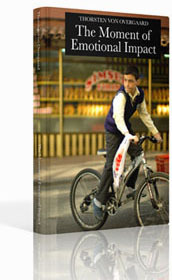 By delivering more ISO, more dynamic range, less grain/noise and higher usability than any black & white film can offer. It doesn't have the smell of film, and it doesn't have the limitation of just a few pictures per roll of film and the sweet waiting time till you see the results. But in color photography work, very few seem to miss the rolls of film, the wait for developing and the work in the darkroom and by the scanner. So why not in black & white photography as well? Inside Starbucks in Hamburg. Leica M9 with Leica 35mm Summilux-M ASPH f/1.4 FLE at 800 ISO. Obviously - when you think about it - the Leica M Monochrom is not aimed at converting color photographers to black & white photographers. It's the camera that fills the gap between the love of black & white photography and the lack of decent black & white images made by converting files from color cameras. The market for a niche camera at a high price as the Leica M Monochrom is probably as hard to see for a market researcher as the market for a Leica M9. Who on earth would want to pay premium price for something that can do less than the popular cameras such as Canon D5 and Nikon D800. Leica M Monochrom with Leica 50mm Summicron-M f/2.0 (II) at 320 ISO. Download DNG file for this image. And now it can do even less than that - and the price even went up! It can be a hard one to understand in a world occupied with always tripling the quantity rather than the quality. The normal marketing philosophy is that we want more and more. And here is a product that gives much less. Hence, don't try to reason with the lack of things this camera has in comparison with the much higher price. If you get the idea, you get it. If not, you probably get something else anyways. Leica M9 with Leica 50mm Noctilux-M f/1.0 (1990-model) at 160 ISO. Photography is about decision-making; in that you have to decide which lens to put onto the camera, where to go, when to be there, how long to wait, when to shoot, how long to shoot, what to focus on, what exposure to set it for. And in the pre-processing you again have to face the difficult choices of selecting which image(s) to select, what to crop away or leave it all as is, which to select as the final image. And more. The morning of the 11th of May after the presentation of the Leica M Monochrom in Berlin I was sitting in the large window over the street corner in Berlin and wondering about this new camera: When I go on assignment, the magazine or client mostly expect color photos, but I also use the opportunity to shoot some photos for my self when anyways in an area or at an event. 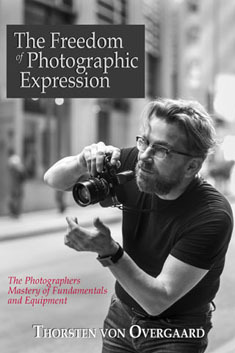 The end result is usually that the magazine or client gets a set of color photos, along with some black and white if I think they might be useful for them. But mostly the photos I take for my own archive, for exhibitions, for my own articles, end up being in black and white. 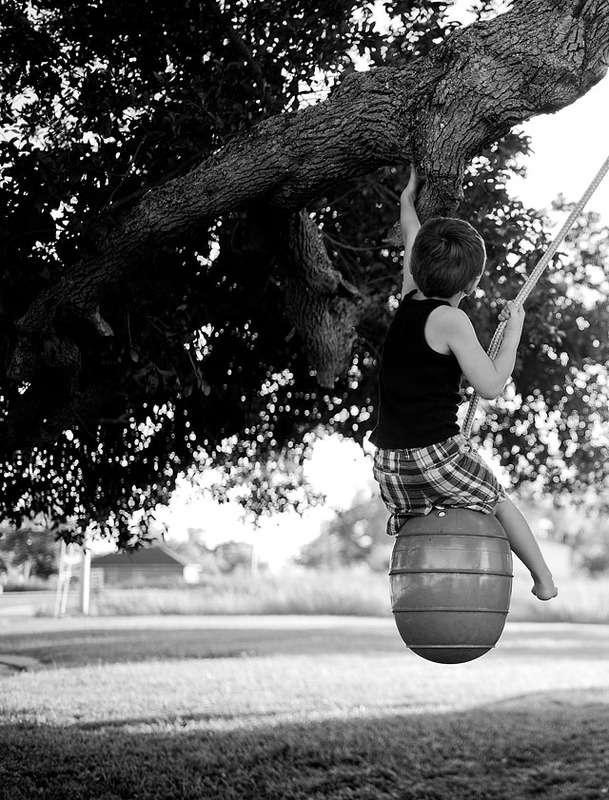 This swinging boy I took before I was doing a portrait of a spokeswoman in USA with her family. It happens to be her son, and I ended up sending the photo to the magazine along with the whole series of portraits and reportage photos. Because it might work well in the feature, and in this case I think they will be using it. Leica M9 with Leica 35mm Summilux-M ASPH f/1.4 FLE. 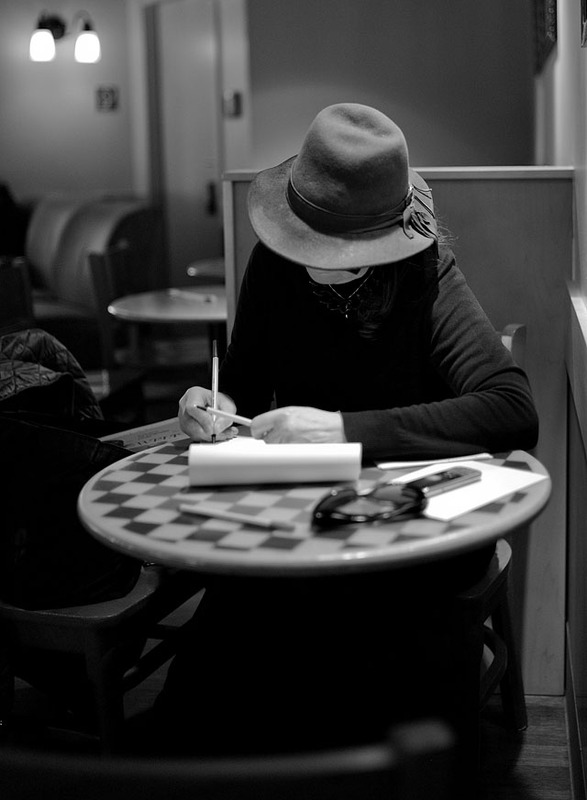 So in reality, the Leica M9 is perfect for doing what I do. I work mainly in color, or at least always stay at 800 ISO and below so as to make sure the colors are all right, and I always pay attention to color temperature (white balance) even my display preview is always on black and white. But in the edit, I can choose if I want color or black and white for my archive - or some times both versions of an image. 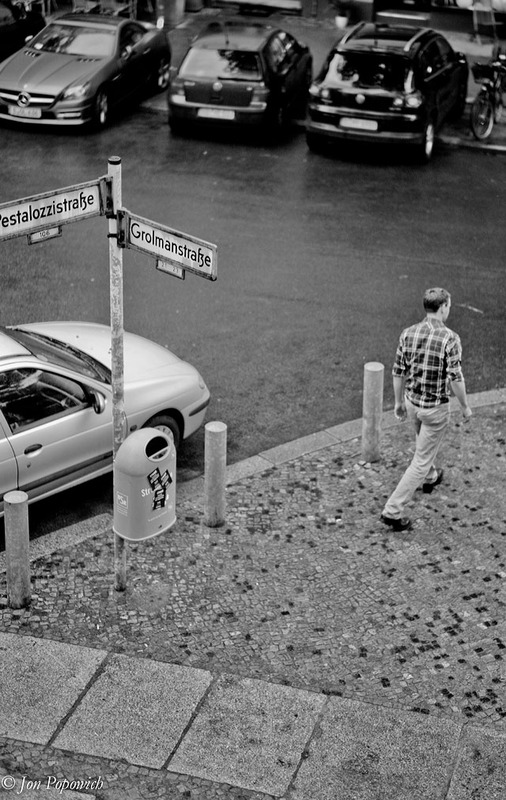 A photo by one of the students who did my Berlin Workshop, Jon Popowich, of the street corner below the window. But as I was standing there in Berlin looking out at the street corner below, I thought, "What if I decided that today I will only see Berlin in black and white?" and then I tried to transform the blue van that drove around the corner to a grey tone. And I scanned the street and the surroundings for colors, so as to get an idea if I would be missing any of those colors ... if I went black and white for a day. Leica M Monochrom with Leica 50mm Summicron-M f/2.0 (II) at 320 ISO. This idea was so refreshing that it made me smile. It would actaully make life easier - and likely Berlin more beautiful - if I for a period of a day simply decided to just see things in black and white. 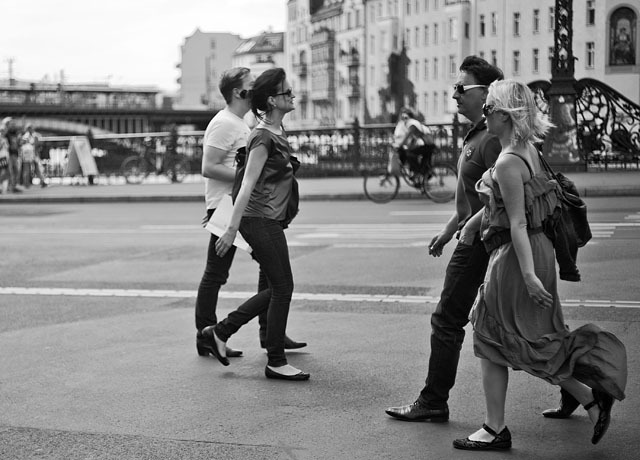 And it was at that point, around 10.00 in the morning I think, I decided that the Leica M Monochrom was for me. The indecisive moment in the morning where the decision to go black and white for the whole day made it all clear and simple! (And to justify this further; when I decided for the Leica M9 back in 2009 I was a dSLR shooter of Leica R9 with digital back. 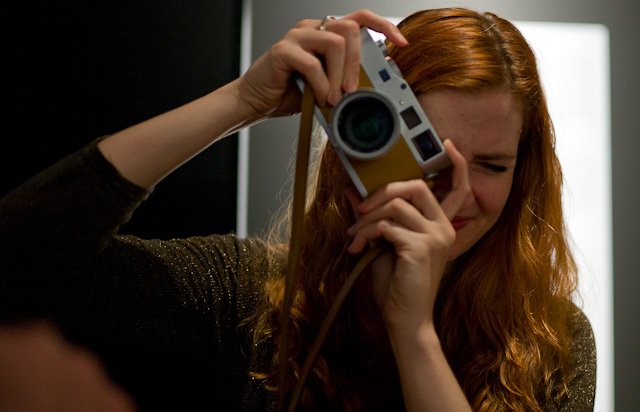 The Leica M9 was solely meant for fun work. 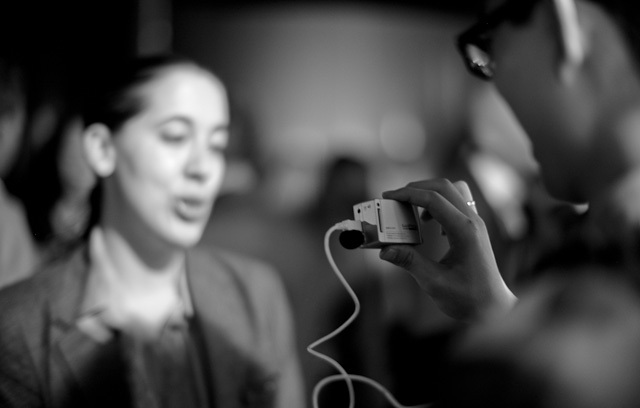 And see what happened, these days I hardly use dSLR for any professional work, only the fun camera, the Leica M9). 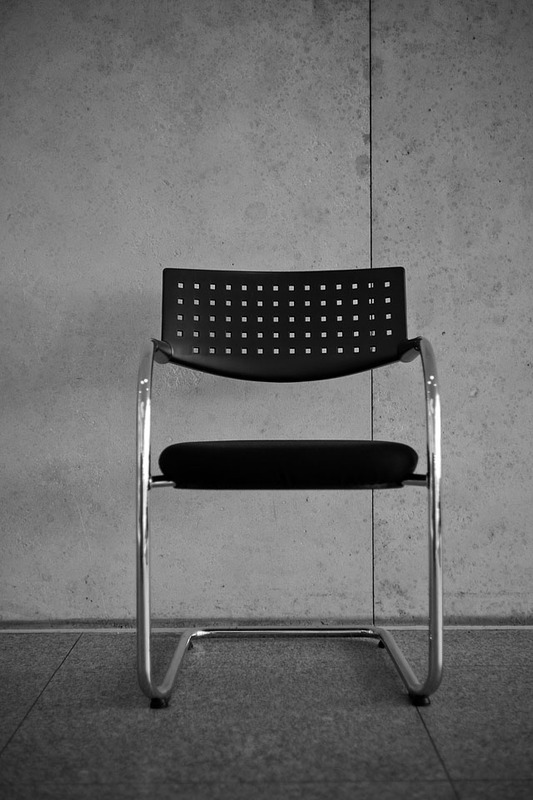 The simplicity of the Leica M Monochrom: It's fun! Everything is as it is with the Leica M9, except the paint is different. It's sort of matt black. And even the white numbers on the shutter dial and on the camera body is rather bright grey than bright white. It's a very monchrom design ... I like it. Leica M Monochrom with Leica 50mm Summicron-M (II) at 320 ISO. Download DNG file for this image. One of the big surprises when you are about to go out and shoot with the Leica M Monochrom is that the ISO starts at 320. Now, this is great in a dark concert hall. But in sunshine it's quite a different ballgame and you make a note that you will have to rethink your ND-filters (Neutral Density filters, the sunglass filters for cameras that reduced the light that comes through the lens). The base ISO of the Leica M Monochrom is in other words 320 ISO and per definition the best ISO to use. As with the Leica M9 that has a PULL 80 ISO, the Leica M Monochrom has a PULL 160 ISO, and you shouldn't use any of the PULL options as it will take out a lot of dynamic range. And when the sun is out, that is where you need the dynamic range the most, because that is where the highlights are very strong and the shadows very deep and dark. But this is the first sign of the digital age: 320 ISO used to be the high-speed film you would load into the Leica M6 or Leica MP when doing low-light work. Now it's the daylight ISO! 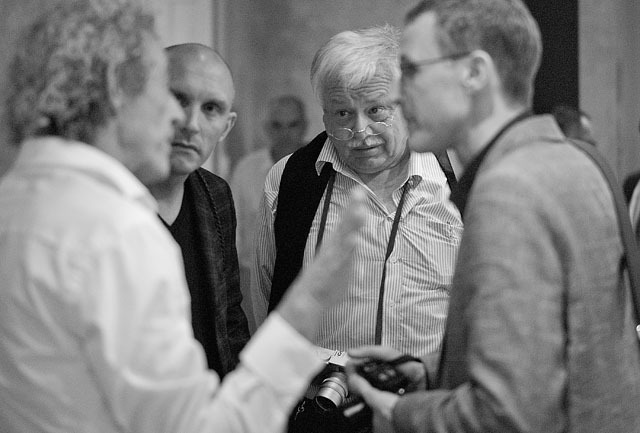 Familiar faces talking about the Leica M in Berlin; Jonathan Slack, Steve Huff, Jaap of the Leica User Forum and Matthias Frei. Leica M Monochrom and Leica 50mm Summilux-M ASPH f/1.4 at 5000 ISO. The scale goes up to 10,000 ISO and 6,400 ISO is safe to use, and if you need 10,000 it can be done. It makes you rethink the need for Summilux f/1.4 and Noctilux f/0.95 lenses, but I decided I still need them for the artistic look; I just need to rethink which ND filters I have with me. I found the Leica M Monochrom to be really fun using. The equipment seem familiar but the viewpoint of black and white and the idea that you can capture black and white in an optimum quality fuels the enthusiasm. One of the best features of a camera is just that; it makes you see things and want to make images. Victoria Weiland. 320 ISO with Leica M Monochrom and Leica 50mm Summicron-M f/2.0 (II). Download DNG file for this image. 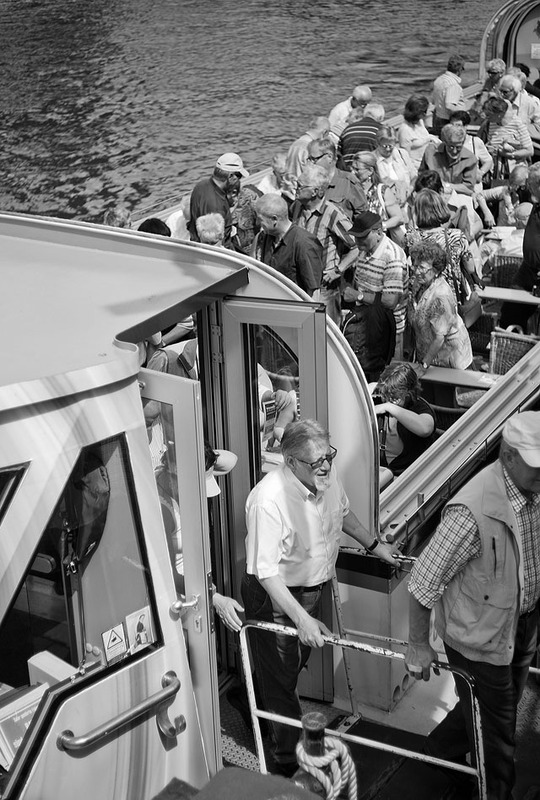 As you will notice, the images on this page is from the Leica M Monochrom and the Leica M9. Which is what, and is there actaully a difference? That is the question I am asking my self. It took me a long time to gradually get to the workflow where I can just hit the right tones with the Leica M9 Fine JPG files and Lightroom 3. With the Lightroom 4 they changed the tools slightly, and when you open a Lightroom 3 file you were satisfied with, Lightroom 4 offers to update it. And then the intelligent question of course then is; was that an update or a degrade? Likewise with the Leica M Monochrom DNG files versus the Leica M Monochrom JPF Fine files: Is the DNG acutally the one I like the best, and how do I make the look I want from it? I'm not there yet. 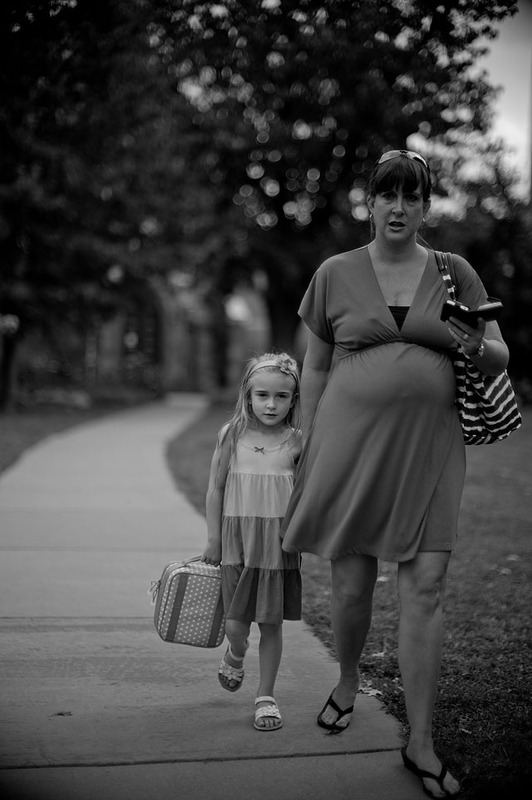 With the few files I got to play with, I feel I could make the same tones with the Leica M9 in most cases. 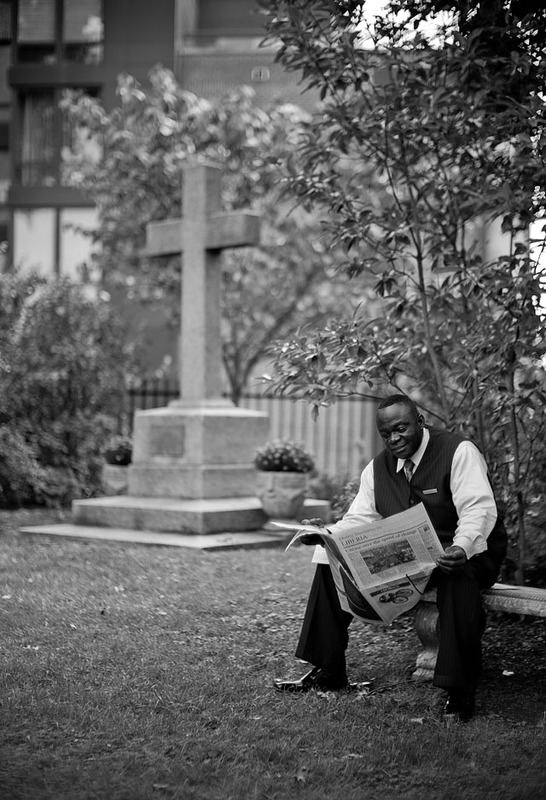 But the Leica M Monochrom also requier a different thinking in shooting the files. Though not that relevant because the Leica M Monochrom is only used by a few who test the prototypes and report bugs back to Leica Camera AG, the Lightroom 4 doesn't have the right settings for importing monochrom DNG files yet. It's part of the work that has to be done between now and August when the first Leica M Monochrom cameras ship. But most of the photos on this page from the Leica M Monochrom I finished in LR 3 because I found them more pleasing from LR 3. But if - or when - you get your Leica M Monochrom, make sure to check the latest and greatest at the Leica User Forum as there will be a few nerds who will burn the midnight oil to find the best settings for all of us. Of course, if you wish, you can download these DNG files and start playing. But the software is not made completely ready yet. 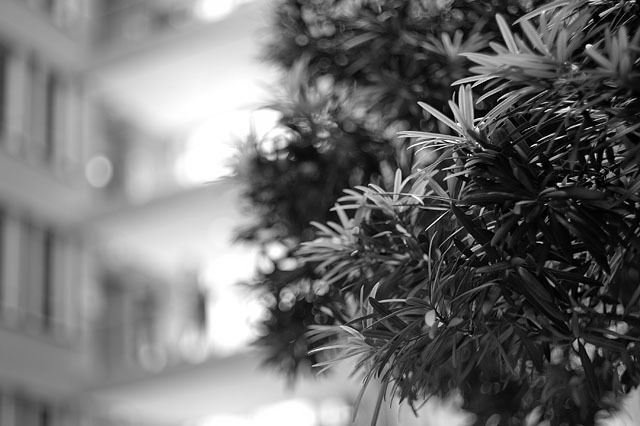 Leica M Monochrom with Leica 50mm Summicron-M f/2.0 (II) at 320 ISO via LR4. Download DNG file for this image. What Jonathan Slack keeps telling me is that I must not over-expose the shots. I disagree to begin with, because I like to shoot against the light, and that means blown-out highlights. If I photograph a person in the street I expose for the face and let the background blow out if it has to. I don't care, it's the face I want exposed correct, and one of the advantages with Leica lenses are that the overflow of light behind the subject stays behind the subject and doesn't overflow onto the face. Leica glass has extremely good control with light rays; what is shadow is shadow and what is light is separated. Totally. But as I shoot with the camera in daylight and later look at my shots from the evening of May 10 in Berlin, I get what Jonathan Slack is saying. Because I see how sloppy the Leica M9 has made me. I expose too bright in evenings becasue I can remedy it. I prefer brighter than actual exposure because I can bring back tones by reducing exposure and increasing Recovery in Lightroom 3. And when I use the Fill Light in Lightroom 3 along with the Blacks I get a pleasing result with shadow details, good overall greytones and a good solid contrast. I find it easier to get good photos with the Leica M9 this way, rather than undersposing and having to bring back details and light in photos that basically lack the information about the light. But with the Leica M Monochrom there is no details to bring back when I bring down the exposure and increase the Recorvery. It's just not there, it's a white area of no information gathered! 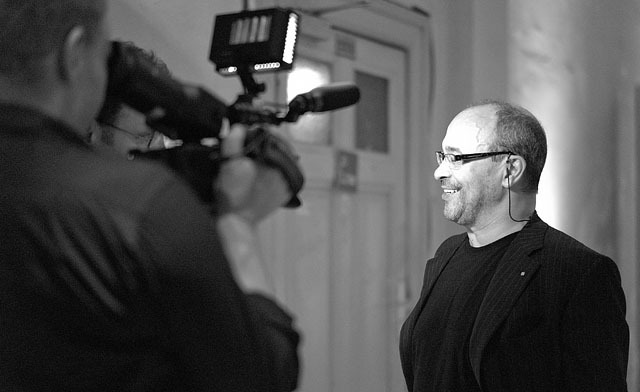 My photo of Andreas Kaufmann being interviewed was overexposed, also if it had been a Leica M9 file. But with the Leica M9 file I would have been able to get it to look natural. 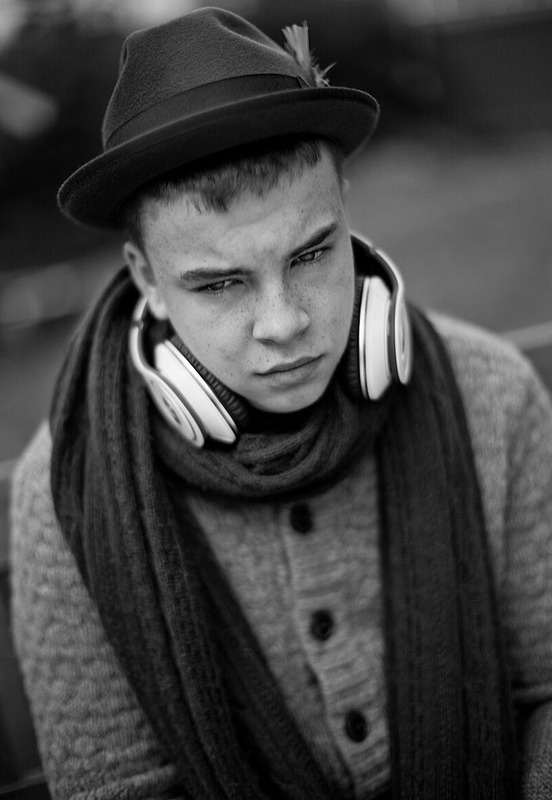 With the Leica M Monochrom his forehead stays white, there is nothing I can do to get the tones back. 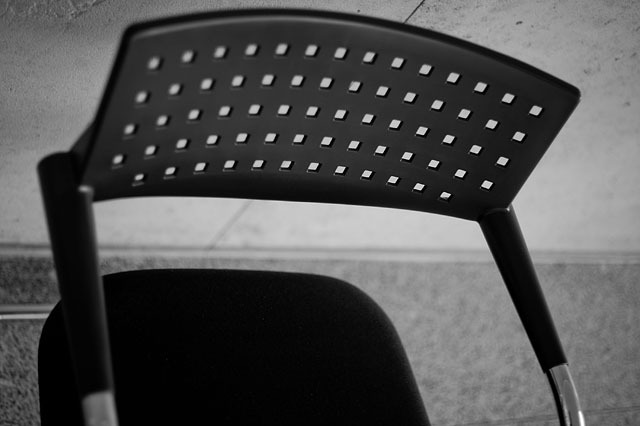 Leica M Monochrom with Leica 50mm Summilux-M ASPH f/1.4. Download DNG file for this image. It's not bad, it just means that I will have to stop being sloppy and shoot like I did when I was shooting slide films. With slide film you have to hit the exposure within 1/3 to have it right as there is no adjusting after the slide has been developed. It's the final shot. To get that right you can use external light meter, and when in doubt you shoot three photos. One at what is supposedly the right exposure, une 1 stop under and one 1 stop above. Or 1/2 stop over and 1/2 stop under if you feel you are precise enought with that. The clarity of detail and the reason the 18 megapixel Leica M Monochrom sensor (may) behaves like a 24 or 37 megapixel sensor is shown in the above. 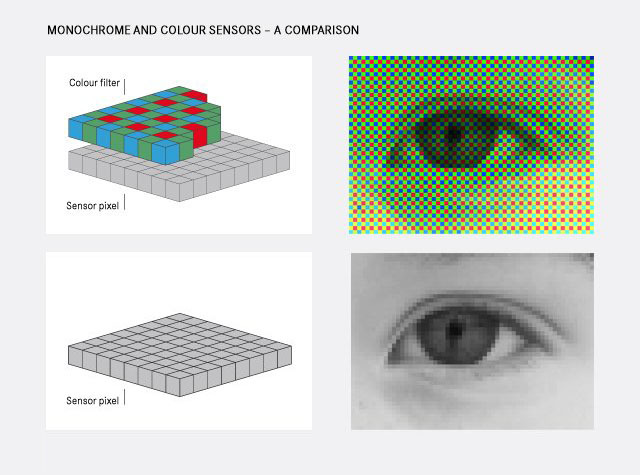 A normal color sensor has a layer of the three main colors (Red, Green and Blue) on top; the way a color image is recorded is basically that the sensor records the strength of light from each color channel and that way determines the color it has to record. The Leica M Monochrom sensor is 'just the sensor' without anything on top, hence every small 'eye' on the sensor is directed to record monochrome tones - or simply luminance. Hence this will be a different ballgame shooting just luminence and not - as we have been used to - the colors trated via color conversion in Lightroom (I'm talking about traditional b&w photography made from color RAW to what the Leica Monochrom will do to our way fo looking at the world). 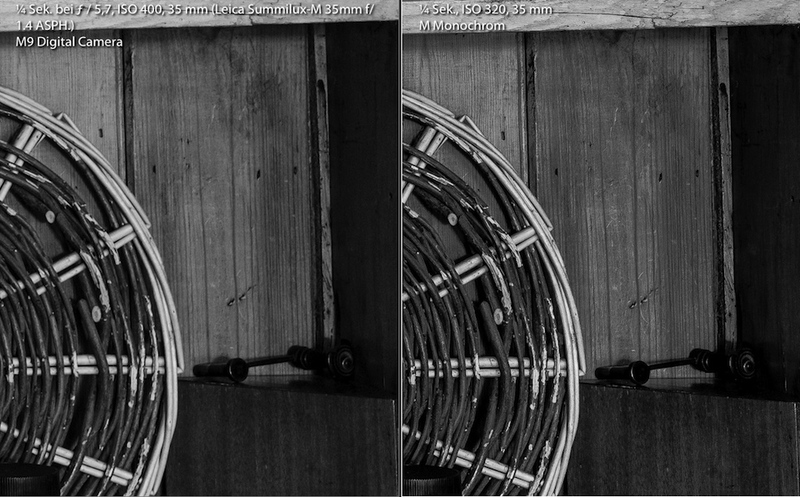 Comparison between Leica M9 (left) and Leica M Monochrom (right). Click on the image for a slightly larger view. Photo: Jonathan Slack. You may find this article "Thy Bumble Bees Can't Fly" by Michael Reichmann useful to understand film resolution versus digital sensor resolution. A micron is 1/1,000th of a millimeter and film has a 2 micron grain whereas a sensor has a 6 micron. But the film only record one tone in a grain, whereas the sensor records several tones. When lensrentals.com in Memphis got their first Leica M Monochrom by end of August 2012, Roger Cicala took it for a test, which you can read in full on their blog, "MM MM Good?" Moving to the conclusion on sharpness, Roger states "lThe bottom line, though, is that this time the non-gearheads are right: throw away the numbers and go take some pictures." The reson for this was that first they did some tests of the RAW files that showed that the MM had 628 lines of sharpness, whereas the Leica M9 had 530 lines. That wasn't that inpressive, but then they got the idea that likely their Imatest test equipment was used to sensors with Bayer array (anti aliason filter that blurs the image) that the test uquipment didn't really understand to appreciate the Leica M Monochrom filter. So they did a new test with JPG files out of camera that now showed 2050 lines resolution from the Leica M Monochrom files compared to 1260 lines from the Leica M9 JPG files. But what prompted them to doubt the Imatest had got it right, was simply that when they looked at the prints from Leica M9 and Leica M Monochrom, the M was clearly better, "After we looked at the MM images it was obvious they showed a lot more detail than the M9 images. It didn’t take a side-by-side comparison to tell the difference; it was clear. That didn’t make sense given the numbers." In the conclusion Roger Cicala says he's not a rangefinder man, so he wouldn't get one. But he does say, "But will I take it out and play with it? Abso-damn-lutely!!! I’d call it Black and White meets HDR. It’s very attractive, whatever it is. I do a lot of black and white conversions and I can’t say I’ve ever achieved exactly this look. If I had I’d have been bragging about it." The base ISO of 320 and the maximum of 10,000 ISO that will actually be usable will change quite a lot. Where a 2-stop ND filter was enough for the Leica M9 at 160 base ISO, you have to get a 3-stop. And for the Noctilux it's even worse! 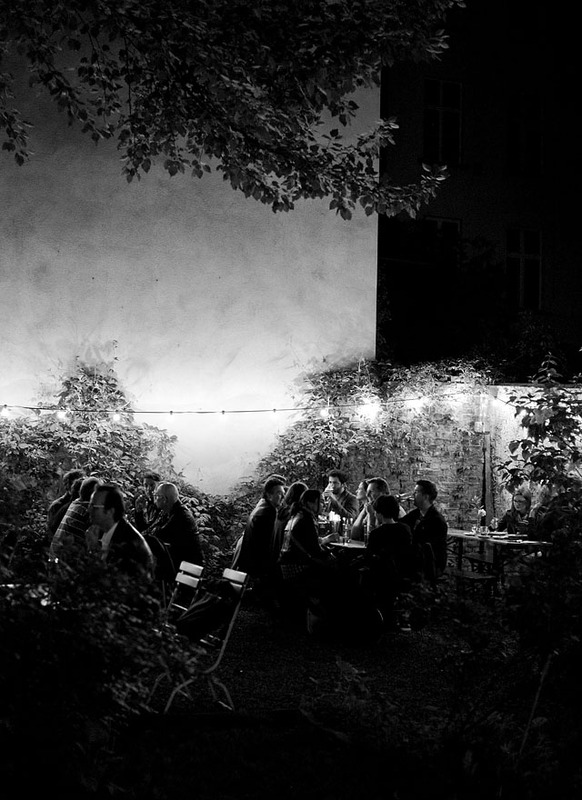 Leica M9 and Leica 35mm Summilux-M ASPH f/1.4 FLE at 2500 ISO outside Clärchens Ballhaus in Berlin. Despite the delivery started medio August 2012, the first special editions has bee delivered. First one is the Silver Leica M Monochrom (Mono Chrome as it has been named). This nice camera was made by Leica Camera AG for photographer Alexander Tufte who also did these two pictures of the camera. What does it take to get a special edition like this made. You siomply ask Leica Camera AG if they can make it, and if they can, the will tell you how and when. 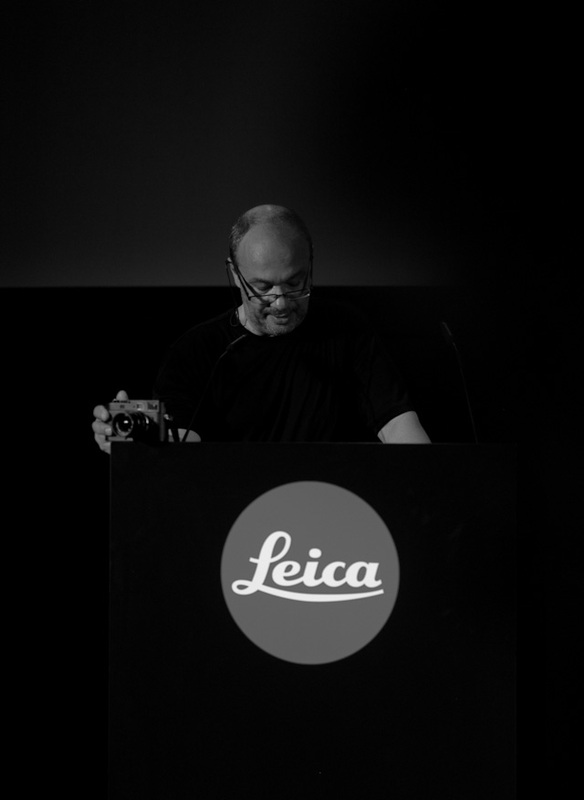 "Henri - The Leica M Monochrom" article by Jono Slack who - likewise as he did with the Leica M9 prototype back in 2009 - took the prototype Leica M Monochrom to China and made a beautiful simple article about his experiences. Jonathan Slack has also made some of his DNG files available. Ming Thein does some very interesting reviews and have started a three-part of the "Leica M Monochrom review" on his blog. Also Sein Reid Reviews www.reidreviews.com have had the Leica M Monochrom prototype out for testing and have written a good review. This is for subscribers so you may want to subscribe (33$ per year). 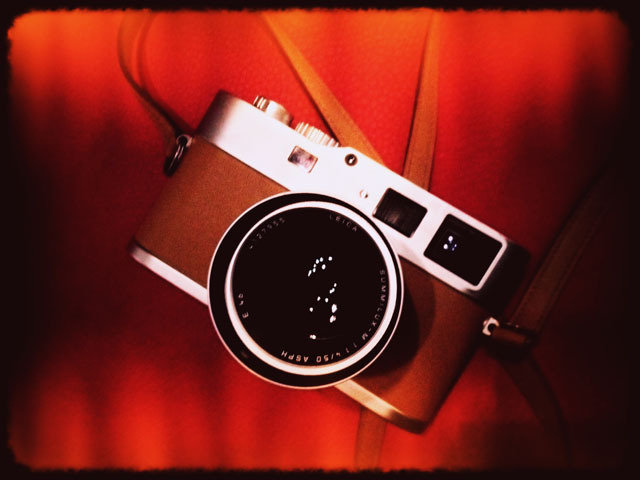 David Farkas have done a review as well on the Red Dot Forum of the Leica M Monochrom. 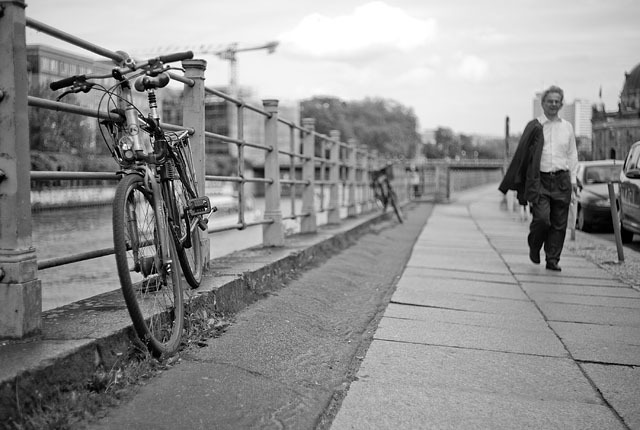 He has also done a ISO comparison between the Leica M9 and Leica M Monochrom. Luminous Landscape also have tested the Leica M Prototype and have written about it here. Steve Huff also have written a bit about the Leica M Monochrom and will be having one for test and review for a week within long. 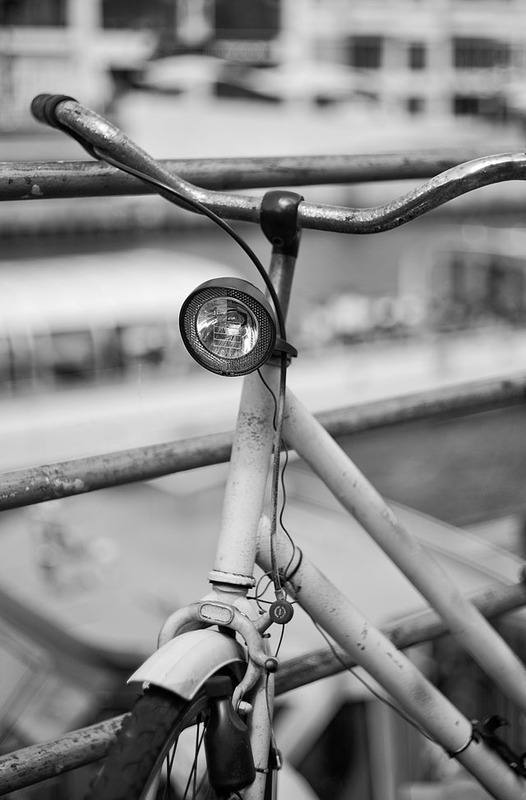 The street photographer and blogger Eric Kim will be adressing the Leica M Monochrome in future posts. 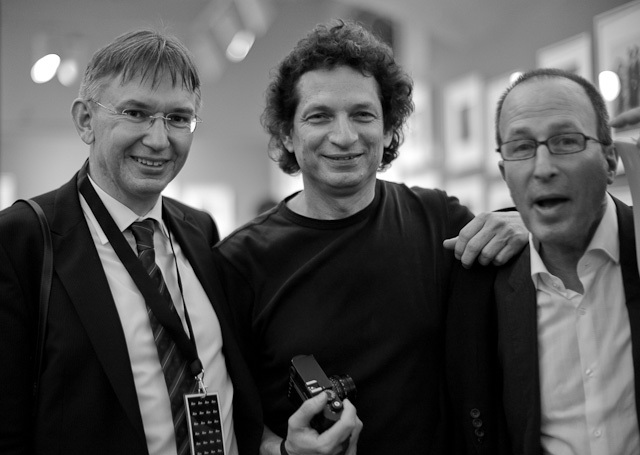 Finally, but not least, British based World Press winning photographer and Leica M9 shooter Edmond Terakopian have written the blog post "The King of the Tones?" with a short hands-on review. Sort of live blogging from the event in Berlin. 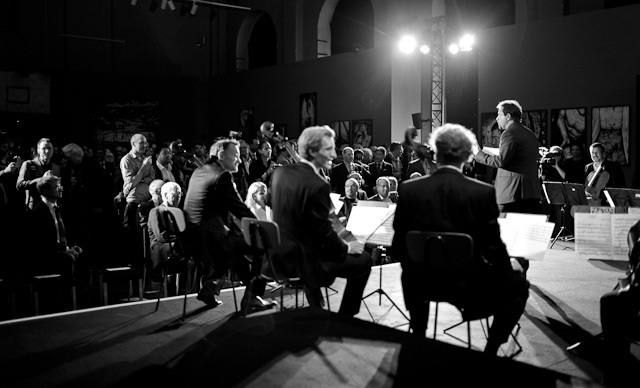 So far enjoy the Berliner Philarmoniker twelve cellos playing up for the event. Chief of Leica S2 (and Leica S3) development with photographer Anthony Suau and agent Bill Charles. The prototype of the Leica M9 Hermes limited edition (100 pcs). Note the design change of the top of the camera. 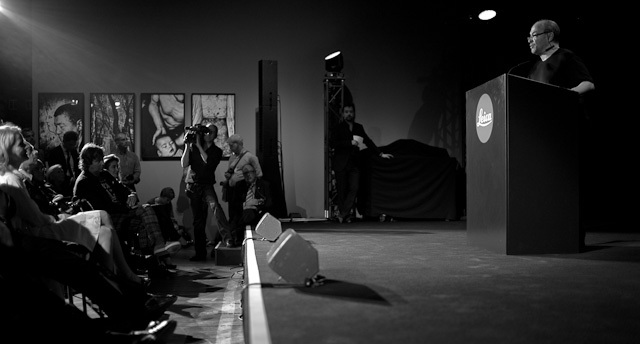 It will likely take a while before the Leica M Monochrom is ready for delivery, probably August 2012. So unless I get my hands on one before, that will be when I will address it more closely. 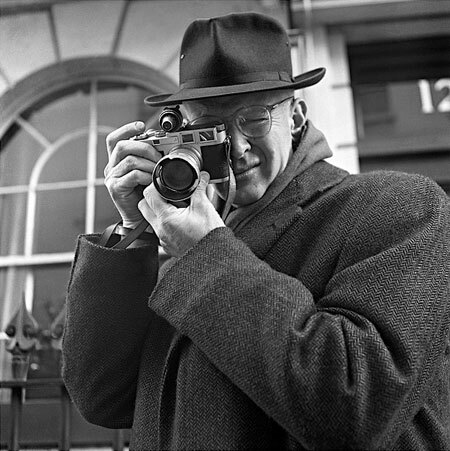 Jonathan Slack has done a field test of the Leica M Monochrom prototype. 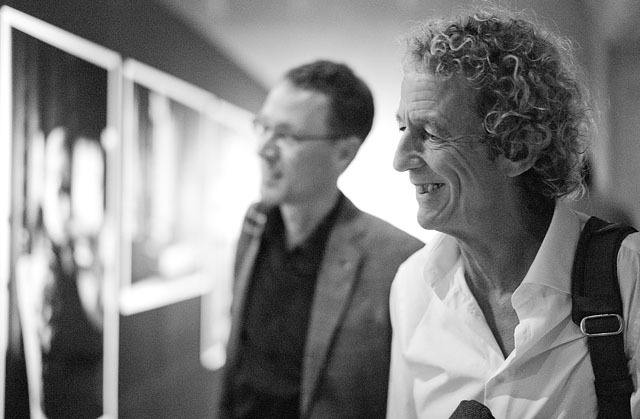 Also Ming Thein did a review of the Leica X2 that was released as well on May 10 in Berlin. Matthias Frei and Jonathan Slack. Leica M Monochrom and Leica 50mm Summilux-M ASPH f/1.4 at 5000 ISO. 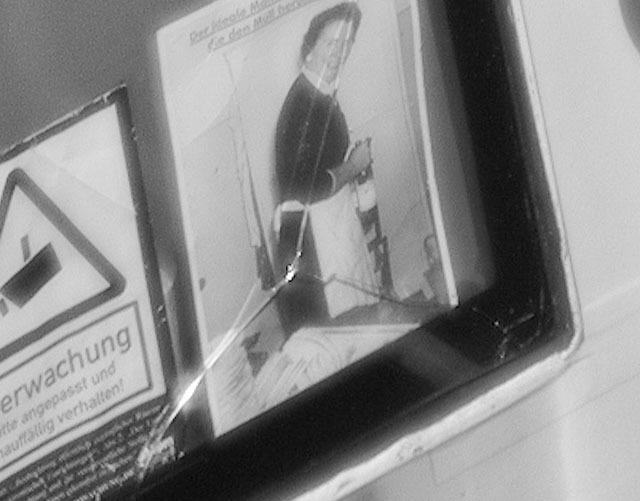 Above: A moment at Paris Bar in Berlin. Leica M9 with Leica 50mm Noctilux-M f/1.0 at 800 ISO. The Leica M Monochrom could have been named simply "Henri" but ended up being named Leica M Monochrom (without an e in the end, plese note!). But the line back to Henri is quite obvious.